This editorial describes the PP Blog’s thoughts on the matter. Containing HYIP fraud schemes and online crime in the Information Age is a daunting challenge. There definitely is an element of whack-a-mole. As soon as law enforcement takes action against one scheme, a new one rises to replace it. The schemes often operate across borders, making the challenge even more daunting. There can be no doubt that these schemes pose a threat to both economic security and national and international security. The mass marketing of criminal schemes is a recipe for anarchy and puts the legitimate marketplace at risk. If you’re a reporter or Blogger covering online fraud schemes, it’s a safe bet your site soon will be lined with “comments” in “support” of the schemes. Once you wrap your brain around the mind-bending reality that Ponzi schemes actually have “defenders,” you shouldn’t be surprised if you end up spending more time performing maintenance chores on your site and less time reporting on scams. That’s exactly what the scammers want, of course. And they might not stop with simple distractions. But if your site has been around long enough — and the PP Blog has been around long enough — you perhaps will notice that some of the “comments” you receive will be deeply disturbing and will go far beyond an amateur bid to sanitize a fraud scheme as a legitimate business. Some individuals “defending” a scam will use menacing language. Their would-be “comments” will include direct or veiled threats. Some of them will plant the seed that somebody might just die if you keep reporting on fraud schemes. That “somebody” just might be you or a family member, they’ll imply. Sometimes they’ll state it plainly. Last month the PP Blog reported two specific threats to the U.S. law-enforcement agency that handles such things. These threats weren’t directed at me. Rather, individuals who tried to post here directed them at others. For security reasons, I won’t get into the details about who was threatened and what was said. In a general sense, I’ll say that it’s not very smart to use this Blog in a bid to convey threats. And it is foolish beyond measure to plant the seed that you’re the type of person who might be involved with a group that’s talking about carrying out political assassinations — you know, because you perceive the individuals you reference in your would-be posts to be enemies of what you view as “free enterprise” and what people who understand mathematics and serialized criminality view as five-alarm fraud schemes. This Blog operates in a constant environment of threats. Regardless, it tries not to complain too much about things that go on behind the scenes. The news is that scammers are using the Internet to plunder residents of town after town, city after city, country after country. Our focus is to bring to public attention the greatest white-collar fraud epidemic in history. Some of the stories wouldn’t sell as fiction because they require the suspension of too much disbelief — but they nevertheless are very, very real. Now, to the purpose of this post . . . This Blog is widely read by law enforcement, which uses it for the purposes of research. One of the most important parts of the Blog is its cloud tags. The Blog uses a WordPress widget that tracks certain keywords. The more mentions a certain keyword gets, the greater its size becomes in our sidebar widget. The graphic (above/left) is a screen shot of our cloud tags as they exist today in the sidebar. 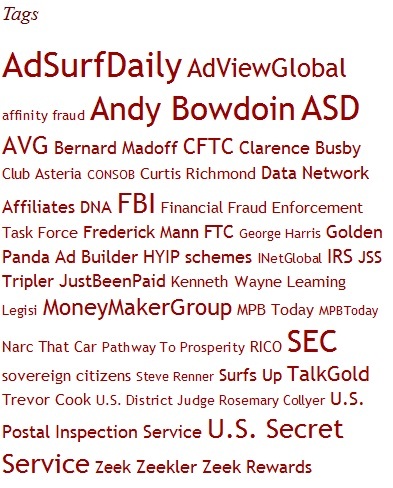 By looking at the screen shot, you’ll see that, as of today, electronic Ponzi schemer Andy Bowdoin has been referenced on the PP Blog more than brick-and-mortar Ponzi schemer Bernard Madoff. You’ll also see the name of Kenneth Wayne Leaming, the Washington state resident and purported “sovereign citizen” now jailed at a federal facility near Seattle on charges of targeting public officials in harassment campaigns. The tags — along with the Blog’s search form — put a lot of information in a common area. As of today, the PP Blog has an archive that includes nearly 1,800 stories. Hundreds and hundreds of thousands of words appear on the Blog, along with thousands of links to information sources both internal and external. Tags and the search function help readers get to what they want to see faster. In no small measure, the tags and the text snippets and included links tell the story of these very troubled times — and what law enforcement is doing to restore order after the U.S. capital markets almost tanked in 2008. This Blog has used WordPress for nearly four years. Never once has it received a complaint about its tags. Today I am reluctantly reporting that a regulatory agency that should know better and apparently understands neither WordPress nor the Internet in the era of epic white-collar fraud contacted the PP Blog and asked that its tag be removed. And just what allegedly was “misleading?” Why, our single-entry tag for the Washington State Department of Financial Institutions (DFI). DFI apparently believes the Blog’s automatically generated tag line that reads “You are browsing the archives of ‘Washington State Department of Financial Institutions'” could cause readers to mistakenly conclude they are on DFI’s website, not the PP Blog. DFI got a mention on the PP Blog on Thursday, and we created a tag for the agency. The CFTC, which stressed cooperation among agencies when it announced the case against an alleged $53 million Forex fraud operating across national borders, thanked DFI and several other agencies (both domestic and international) for their cooperation. We thought that noteworthy, so we referenced all of the agencies in our story. But our tag on DFI is “misleading,” the agency says. “Please remove the info-box on your site,” the agency says. Friends, I have to tell you that I was stunned. Both individuals and criminal organizations are stealing money by the tens of millions now. As Gregg Evans has pointed out repeatedly, traditional bank robbery with guns and masked intruders is largely going out of style because it’s “safer” to steal even greater sums of money on the Internet. This Blog exists to expose that fraud. It is here 24/7/365, and it is sustained only by the goodwill of small handful of individuals. The Blog is hanging by a prayer — even as criminals send taunts and menacing communications and threats. We are honored that the law-enforcement community comes here constantly to read about what’s going on “out there” during these deeply troubling times. The threat to law and order never has been greater. “Sovereign citizens,” for example, are filing bogus liens against public officials, threatening judges — and holding “seminars” to teach others how to become anarchists. One of the places “sovereign citizens” are operating is Washington state, DFI’s home state. This Blog also maintains a “sovereign citizens” tag. It is darned hard to get bad press on the PP Blog if you’re an agency engaged in the worldwide fight against fraud. But DFI is getting some today. Fortunes are being stolen worldwide. Bogus liens are being filed against public officials. Reporters are being menaced by cyberstalkers who are running interference for criminals — and DFI wants to complain about a tag that serves the public interest and creates confusion only in Bureacratic La-La Land. Get a clue, DFI. Your tag, though, now has been removed at your request — and it is a stupefying loss for the public. A reader contacted me this morning with the idea that I could edit the WordPress theme for the PP Blog that automatically generates the “You are browsing the archives of” line built into the tags. So, I tried that — and got a database error message that affected all of the tags. I tried again — this time by removing an apostrophe in the substitute phrase I’d initially entered in my editing attempt. This action slowed the site to a crawl, but appears to have worked. I still do not believe the theme’s built-in tag line confused readers as to whose archives they were viewing, given they were on the PP Blog at a PP Blog URL. But I did change it in an abundance of caution. The site is behaving strangely right now, with one database error after another. I was on the phone with a reader who was unable to access the site — and I’m trying to figure out what is going on. Good Grief! The simple fact that your tags lead the general public to sites like the DFI site and other law enforcement sites where they can read hard information about the various frauds that abound should be justification to keep the tag there. To make it harder for people to find out about fraud seems to me to show a distinct lack of common sense . It certainly highlights the problem that we read about of different government institutions jockeying for position and forgetting the importance of common effort, both to catch the delinquents and to inform and educate the public. The site seems to be operating normally for me. I was going to suggest editing your theme to change the wording on the tag archives. If they had any clue as to what your blog does and the purpose it serves, they should have simply requested you change the wording instead of deleting the tag. I’m sure that American tax payers are happy to see their money being used in this manor. I went to the Washington State Department of Financial Institutions web site & looked at the list of consumer alerts. There are many warnings about payday loan scams and some advance fee fraud. 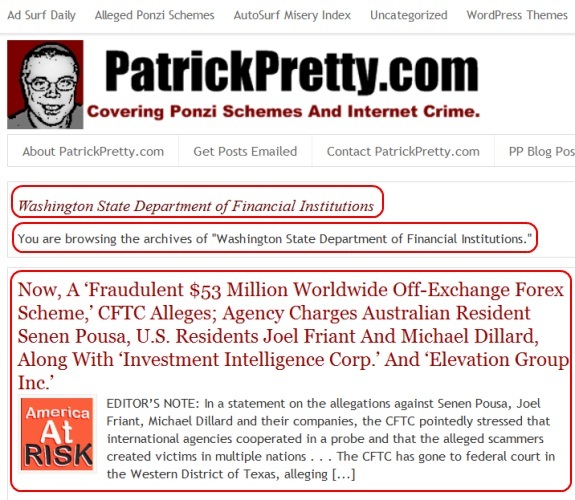 The only warning about ponzi schemes that I could see was a link to a FINRA warning from 2010. I would argue that this web site could not possibly be confused with Washington State Department of Financial Institutions because they seem to post very few warnings about ponzi schemes. The only one I could find was from 2009, I’m not sure if that was reported here. Chris Bailey: The site seems to be operating normally for me. That’s good to know, Chris. I couldn’t get on the site for about an hour — and when that happens it takes me back to the DDoS attacks of 2010, which took the Blog offline for days. I’m glad we still have a first amendment. What part of “make no law..abridging the freedom of speech or of the press…” doesn’t the State of Washington understand? If we can’t research and talk about fraud, the country is in more trouble than the fraudsters cause. If the blog put up the State Seal, I could understand appropriation concerns. But I don’t think even using official looking documents is objectionable. Just this term, the Supreme Court said the government could not prosecute people who lie about military medals. That conduct is protect6ed. I do not understand why a rational person would complain about warnings to the general public. Just wondering if a phone call would resolve the issue? Quick note: DFI informs me that its concerns have been addressed and that the template change is appreciated. Patrick, I am surprised you never mentioned BannersBroker scheme here and past ponzi scheme activities of their operators. Do you take it as a legitimate business? I think they are most popular today taking the internet investors by storm. Thank you for all what you doing here. Nik: Patrick, I am surprised you never mentioned BannersBroker scheme here and past ponzi scheme activities of their operators. Nik: Do you take it as a legitimate business? No, I don’t believe it is a legitimate business.